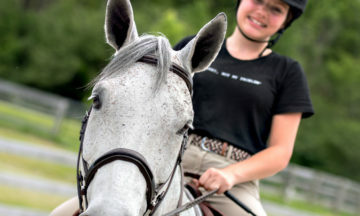 Rookie Riders provides an opportunity for children to experience the joy of the equestrian sport in a fun-filled program. The program teaches activities and skills that are fundamental to success in horseback riding. It includes basic gymnastics on mats, on a “barrel horse” and concludes with an introduction to riding. It is a core skill building program that benefits all disciplines. It is also a safe opportunity to introduce the sport to children we hope will become passionate and continue to progress in the sport with you as their certified coach or instructor. Introduce OR reinforce movement skills within the FUNdamental stage of long term equestrian and athlete development. For an understanding of the skill development objectives typically taught at the “FUNdamental” stage of athlete development, review the Long Term Athlete/Equestrian Development program, HERE. To become certified to deliver the Rookie Rider Program, please visit our Events Calendar for the next training opportunity! Learn how the barrel is constructed and purchase yours today.